Starch gel electrophoresis of extracts of Apis mellifera indicates that genetic variability exists for the enzyme cytoplasmatic malate dehydrogenase (E.C. 1.1.1.37). Analysis of individuals throughout development indicates that the isozyme patterns are identical for larvae and adults and suggests a dimeric structure for the molecule. The isozyme pattern observed in pupae is more complex than that of larvae and adults and may be due to an additional pupalspecific MDH gene being expressed or to an epigenetic modification of the isozymes. Forty-three colonies with artificially inseminated queens were used to study the Mendelian pattern of inheritance. 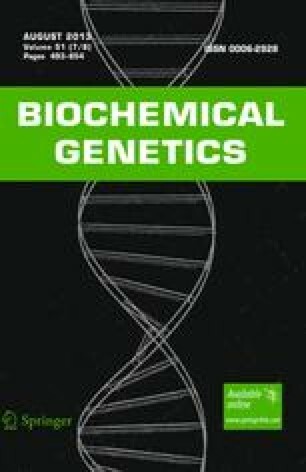 The data revealed that the MDH isozymes are encoded by three alleles, Mdh-1 A , Mdh-1 B , and Mdh-1 C . The frequency of the Mdh-1 alleles is different in two analyzed subspecies, A. m. adansonii (African bees) and A. m. ligustica (Italian bees), with Mdh-1 A and Mdh-1 B in the African bees being 0.768 and 0.202, respectively. For the Italian bees, these frequencies are 0.136 and 0:154, respectively. This work was supported by São Paulo State Research Foundation and Brazilian Research Council (CNPq). In partial fulfillment of the requirements for a Ph.D. Degree directed by Dr. M. A. Mestriner, Genetics Department, University of São Paulo at Ribeirão Preto.